2- How to set a service ? 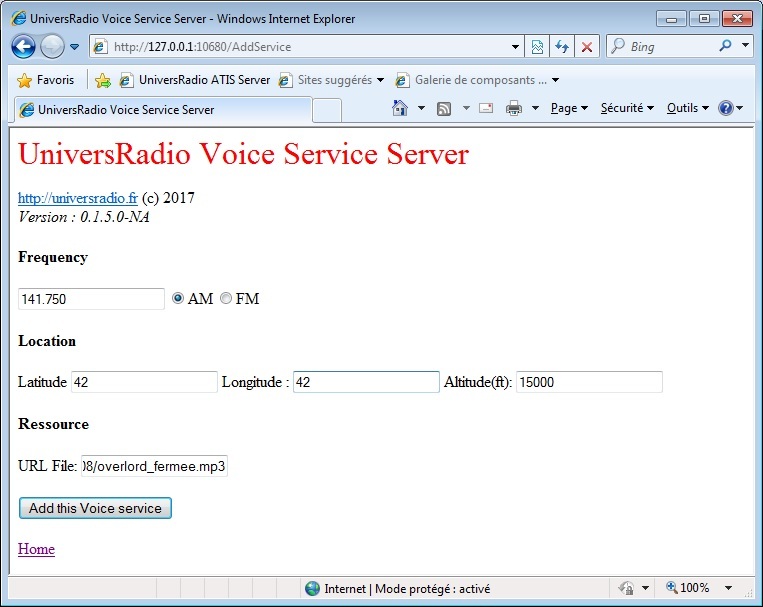 UniversRadio Voice Service works according of a METAR, or an audio file (WAVE, MP3). 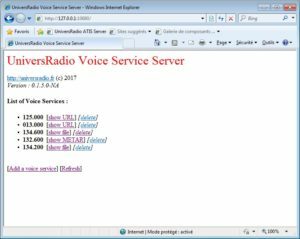 Every TS3 UR client can create an Voice Service. 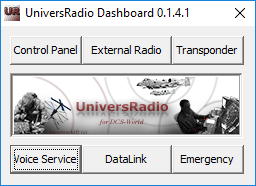 You can launch UniversRadio Voice Service from UniversRadio DashBoard. /!\ For Internet use (normal use, see §System) and for sharing broadcast information, you have to open incoming TCP:10600 port in your firewall/Internet router. Enter METAR (see § 4 Limited METAR Syntaxe format, below). 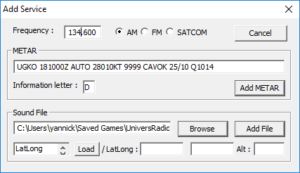 The ICAO code brings the coordinates of transmitter, the airbase itself. 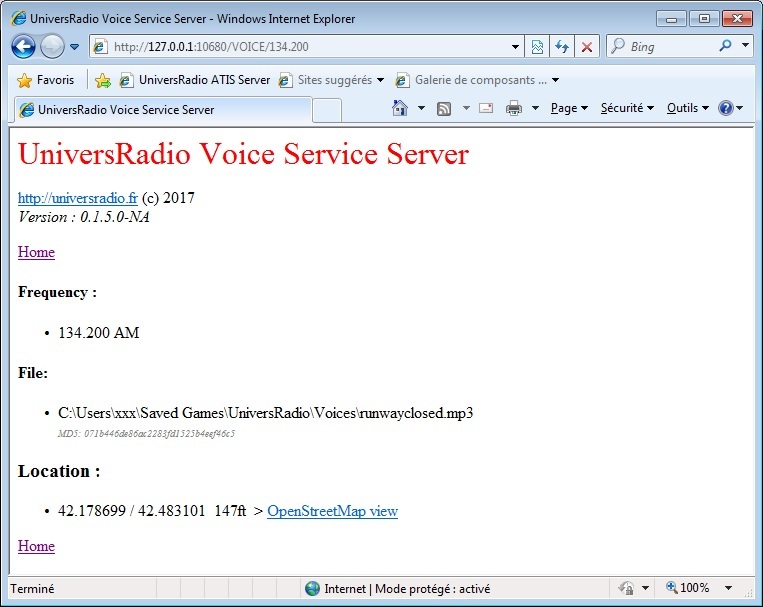 Or select an audio file from ..\Saved Games\Univers Radio\Voices folder. 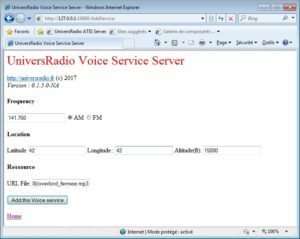 File format can be WAVE or MP3. Enter the 3D location of the transmitter in decimal LatLong (48.068500 -1.730800 ) and altitude in feet. 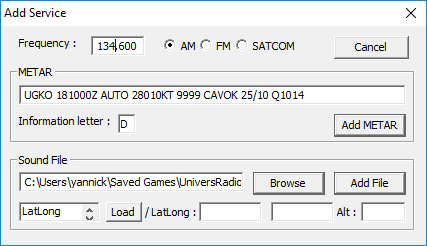 Also you can load a ICAO preset airfield location with the “Load” button.. The transmitter power has the same specificity than an aircraft one. Note, all VS added are stored. They will automatically be loaded at the next VSS launching. 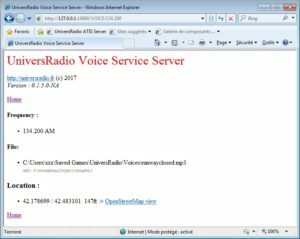 You can check Voice Services broadcast configuration by displaying VSS web page from the “UniversRadio Voice Service Server” shortcut from Start menu, or enter http://127.0.0.1:10680/ in your favorite web browser. 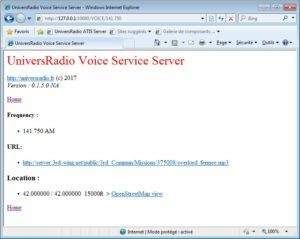 3- How to listen to a Voice Service ? 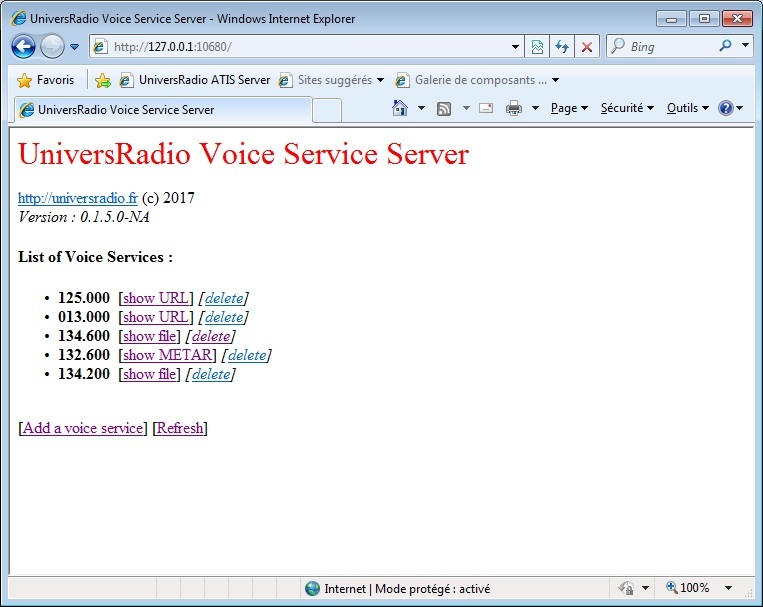 According to the breifing and a UniversRadio Voice Service server setting, set the good frequency on the good radio, and listen, note informations. /!\ To force refresh, change frequency and come back to the previous frequency. Syntaxe is basic and limited. Pay attention for all words. Bad format gives a TS crash for all TS3 clients. Note, local time in Georgia is UTC+4, Krai of Krasnodar is UTC+3, Nevada is UTC-8. So, if local time at Maykop (RU) is 10h30, then UTC will be 06h30. At Nellis, if local time is 3pm, then UTC will be 23h00.